On the evening of 08 November 1926 Antonio Gramsci was arrested in Rome and in accordance with a series of “Exceptional Laws” enacted by the fascist-dominated Italian legislature, committed to solitary confinement at the Regina Coeli prison. This began a ten-year odyssey, marked by almost constant physical and psychic pain as a result of a prison experience that culminated, on 27April 1937, in his death from a cerebral hemorrhage. No doubt the stroke that killed him was but the final outcome of years and years of illnesses that were never properly treated in prison.Gramsci never saw his second son. At the trial of Antonio Gramsci in 1928, the prosecutor declared: “We must stop this brain from working for 20 years.” Gramsci, the former leader of the Italian Communist Party and a gifted Marxist theoretician and journalist, was sentenced to two decades’ imprisonment by Benito Mussolini’s fascist government. At another time, in another age, in another country but at similar situation. Case of Abdul Nasser Madani . Madani is suffering only because he speak out.Justice V.R. Krishna Iyer asked a responsible political leader. “The man is without one leg why should you torture him”? The politician replied “Though he is short of one leg, his tongue is longer and with that tongue he is creating problem for us” .So they made it clear that Madani is suffering only because he speak out. Rather than focusing on muslim issues exclusively, Madani’s efforts were to bring all the marginalised communities together.It shows how Madani was different from other leaders.What a charismatic orator and great scholar of Islam Madani has been. 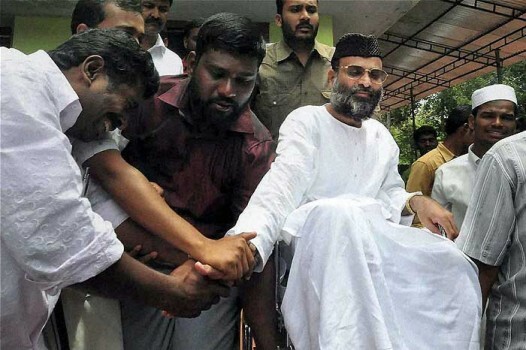 Madani was arrested because he and his People’s Democratic Party (PDP) became a threat for many political parties .Madani initiated a campaign on ‘Power to the Avarnas’ and he is victimised for trying to implement this slogan. Today Madani’s health condition is too bad.His one eye has become useless and he can not read now. His only remaining leg is paralysed. And he needs specialised treatment for many health disorders for a long time. The International Covenant on Economic, Social and Cultural Rights ( ICESR) states that “prisoners have a right to the highest attainable standard of physical and mental health”. The United Nations Standard Minimum Rules for the Treatment of Prisoners were adopted by the United Nations General Assembly on 17 December 2015. They are known as the Nelson Mandela Rules in honor of the former South African President Nelson Mandela.The Rules were first adopted on 30 August 1955 by the United Nations Congress on the Prevention of Crime and the Treatment of Offenders. But Karnataka Government has refused to provide proper health care to Madani. It is obvious that his health is deteriorating day by day. When K.P. Sasi and his friend met Madani in jail, Sasi asked him “what can we do for you”? Madani said that There was some moral strength maintained by me due to that presence of some visitors every week but there were thousands of innocents languishing in Indian prisons and Madani appealed to do something for them. He added, “I am not the only one”. The other context is that many of these prisoners are languishing in jails due to draconian laws”. It is high time that this country removes the Unlawful Activities Prevention Act (UAPA), Armed Forces Special Powers Act (AFSPA), sedition law, and similar other laws which are a blot on Indian democracy. According to the Prison Statistics India 2015 report by the National Crime Records Bureau (NCRB) India’s prisons are overcrowded with an occupancy ratio of 14% more than the capacity. More than two-thirds of the inmates are undertrials. Sixty seven percent of the people in Indian jails are undertrials those detained in prisons during trial, investigation or inquiry but not convicted of any crime in a court of law. According to NCRB records, out of these 2.82 lakh undertrial inmates, over 55% are Muslims, Dalits and tribals. Collectively, these three communities form a population of 39% with a share of 14.2%, 16.6% and 8.6% of population respectively according to 2011 census. But the proportion of prisoners, both convicted and undertrials from these communities is larger than their share in the country’s population. Undertrials often remain behind bars for years despite the provisions of Section 436 A of the Code of Criminal Procedure (CrPC) which came into effect in 2005. This section mandates the release, on personal bond with or without surety, of undertrial detainees who have been imprisoned for half the maximum sentence they would have received if convicted for the offence they are charged with. Many undertrials are poor people accused of minor offences, locked away for long periods because they are not aware of their rights and cannot access legal aid. 14 years is set as the lower limit for the life imprisonment.A convict will have to spend atleast 14 years in prison if he/she has been punished with life imprisonment.But Madani has completed almost 18 years of his life as a fabricated under trial. Its clear violation of human rights. The Universal Declaration of Human Rights states that “All are equal before the law and are entitled without any discrimination to equal protection of the law.” Thus, everyone must be treated equally under the law regardless of race, gender, national origin, color, ethnicity, religion, disability, or other characteristics, without privilege, discrimination or bias. Is it equal protection of law in the largest democracy in the world.The rule of law and the protection of human rights are necessary for a democracy to exist in reality. In a democracy the people are the sovereign and hence govern themselves.Wake up democracy before its too late.